Chairman Coburn, Ranking Member Carper, and Members of the Subcommittee, as the Treasury Inspector General for Tax Administration (TIGTA), I appreciate the opportunity to appear before you today to discuss the scope, size, and nature of the tax gap problem, as well as some opportunities for closing the tax gap. My testimony will also address issues relating to the cash economy. The importance of these issues cannot be overstated. The nation’s ability to provide for the general welfare and protect its citizens is based on the ability to raise revenue through taxes. For our government to perform effectively, it must ensure that the taxes owed are timely paid. It also cannot go unnoticed that the estimated annual tax gap figures closely correspond to the reported fiscal year 2005 budget deficit of $319 billion. Because the tax gap poses such a significant threat to the integrity of our voluntary tax system, one of my top priorities for TIGTA is to identify opportunities for improvements to the Internal Revenue Service’s (IRS’) tax compliance initiatives. My staff is in the preliminary stages of preparing an audit report to assess whether the IRS is positioned to significantly improve voluntary compliance. I expect this report to be issued in 2006.
returns. Within the underreported income component, the IRS has further delineated specific categories of taxes, such as individual, corporate, employment, estate, and excise taxes. However, the IRS is not confident in the reliability of certain components of its tax gap estimate. Areas of uncertainty include portions of the underreported employment tax segment and the underreported corporate tax segment, because the underlying data is 15 years old or more, and the IRS has low confidence in its original estimates. Thus, these figures are simply rough estimates of the tax gap problem. 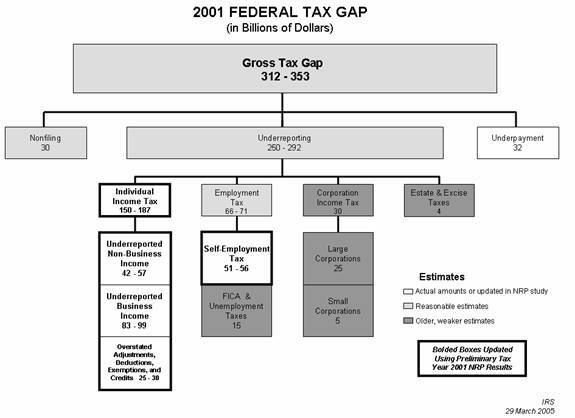 The following chart, which the IRS developed, provides a good visual reference for the various components of the tax gap. Additionally, it indicates which segments of the tax gap estimate were updated based on new data. $312 billion and $353 billion. The net tax gap, which is the portion of this amount that will not be collected after all IRS and taxpayer actions have been completed for a given tax year, is estimated to be between $257 billion and $298 billion. To provide some perspective on the size of this estimate, if collected, these dollars could fund much, if not all of the estimated costs for hurricane relief efforts in the Gulf Coast region. 27 percent of the total gross tax gap). The second largest segment of underreporting, estimated at $66 billion to $71 billion, is the employment tax, which includes social security, medicare, and unemployment taxes. The self-employment tax, which is self-reported, is the largest component of that category at $51 billion to $56 billion (16 percent of the gross tax gap). year 2001. This figure is more than 40 percent of the estimated gross tax gap, and more than half of the estimated total underreported portion of the tax gap. The cash economy is a subsection of this segment and is discussed later in my testimony. From 1963 to 1988, the IRS conducted studies to measure tax compliance approximately every three years. Estimates of the tax gap were first developed from these studies in 1973. However, the program used to conduct these studies, called the Taxpayer Compliance Measurement Program (TCMP), was shelved in 1991 due to concerns about its burden on compliant taxpayers. When the IRS unveiled an expanded approach to measure compliance in 1994, Congress eliminated all funding for this project because of concerns about its intrusiveness. More recently, the IRS initiated a new program to measure compliance, and its results were used to produce the update of the individual tax gap figures. Although better data will help the IRS identify noncompliant segments of the population, broader strategies and better research are also needed to determine what actions are most effective in addressing noncompliance. The Taxpayer Advocate’s 2004 Annual Report to Congress effectively laid out some of the complexities involved in structuring an enforcement program to address the tax gap. The report also addressed the efforts IRS still needs to make to analyze the effectiveness of various compliance techniques. Similarly, TIGTA has identified examination programs that the IRS had implemented nationwide before determining their possible effectiveness or before implementing an effective strategy to measure the results of the programs. The IRS must continue to seek accurate measures of the various components of the tax gap and the effectiveness of actions taken to reduce it. This information is critical to the IRS for strategic direction, budgeting and staff allocation. The Department of the Treasury also needs these measures for tax policy purposes. Additionally, Congress needs this information to develop legislation that improves the effectiveness of the tax system. The cash economy and the resulting underreporting of income for tax purposes have been a significant portion of the tax gap for many years. The cash economy, also known as the underground economy, consists of activities that may be both productive and legal but are deliberately concealed from public authorities for a variety of reasons, such as to avoid the payment of taxes or to avoid meeting certain standards or administrative requirements. As described earlier, underreporting of individual business income and self-employment taxes on filed returns comprises nearly half of the 2001 estimated tax gap. Taking action to improve compliance in this area is critical to making strides in addressing the tax gap. The difference in compliance rates between individual wage-earning taxpayers and those operating businesses is striking. The IRS has estimated that individuals whose wages are subject to withholding report 99 percent of their wages for tax purposes. In contrast, self-employed individuals who formally operate non-farm businesses are estimated to report only about 68 percent of their income for tax purposes. Even more alarming, self-employed individuals operating businesses on a cash basis report just 19 percent of their income to the IRS. Estimates indicate that the cash economy is growing. An article earlier this year in Barron’s on the underground economy in this country estimated that the income in this segment of the population is currently about 9 percent of the gross domestic product and will soon surpass $1 trillion. The article indicated that growth in this segment of the economy has been spurred by corporate downsizing, which has forced many employees to become independent contractors, and by the increasing size of the nation’s population of undocumented immigrants. An April 2002 Economic Roundtable briefing paper entitled “Workers Without Rights” explored the informal economy in Los Angeles. Even using conservative estimates, the study stated that unpaid payroll taxes and insurance benefits exceeded $1.1 billion. The briefing paper estimated the size of the informal economy to be between 9 percent and 29 percent of the employment in Los Angeles County. The informal economy included employment in a variety of manufacturing industries, agriculture, construction and others. Thus, the informal economy operates in many aspects of the economy and obtains a competitive advantage by paying low wages and not paying employment taxes. Although the noncompliance rate in the cash economy is high, the percentage of examinations of self-employed taxpayers is still low. The figure below indicates that in the past nine years, this percentage dropped from 3.60 percent in 1996 to a low of 1.55 percent in 2000. In the last four years, however, the percentage has risen to 2.13 percent. Source: TIGTA Analysis of IRS Data Book Information. Although examinations of these returns should increase compliance, the visibility of the income received by these self-employed individuals needs to be raised. Increase Resources in the IRS Enforcement Functions. 14,400 changes to the code. Furthermore, complexity is costing the U.S. economy $140 billion each year, with over 3.5 billion hours spent preparing tax returns. More than 60 percent of Americans rely on a tax practitioner to prepare their tax returns. In 2001, the Joint Committee on Taxation conducted a study on the complexity of the tax law. The Committee found that, at that time, the tax code consisted of nearly 1.4 million words. There were 693 sections of the code applicable to individuals, 1,501 sections applicable to businesses, and 445 sections applicable to tax exempt organizations, employee plans, and governments. At that time, a taxpayer filing an individual income tax return (Form 1040) could be confronted with a 79 line return, 144 pages of instructions, 11 schedules totaling 443 lines (including instructions), 19 separate worksheets embedded in the instructions, and the possibility of having to file numerous other forms. For the 2005 tax filing season, the IRS estimates it should take, on average, over 19 hours to complete and file a 2004 Form 1040 and the associated Schedule A. Tax law complexity creates a number of problems. It reduces the transparency of the tax system, rewards those with the means and inclinations to find all of the “angles” and then to exploit them, and it undermines trust in the fairness of the system, which may in turn undermine voluntary compliance. The complexities of the tax law also affect the ability of the IRS to administer the nation’s tax system. The IRS’ efforts to provide assistance to taxpayers are hampered because of these complexities. In December 2003, in compliance with Section 2004 of the Internal Revenue Service Restructuring and Reform Act of 1998 (RRA 98), the Department of the Treasury reported to Congress that there are several changes that would make the tax system less complex and reduce compliance costs while meeting its other goal. The United States has attempted to reduce taxpayer burden by primarily simplifying the tax law and tax forms when feasible, and by improving customer service and encouraging electronic filing and the use of tax preparation software. Another approach taken by over 30 countries is a return-free filing system. In most of these countries, taxpayers meet their obligations entirely through tax withholding payments made throughout the year. A few of these countries rely on tax-agency reconciliation. These are systems in which tax authorities prepare tax returns for individuals based on information submitted by employers and others, and then send taxpayers a completed tax form for their review. 66 percent of the 196 tax law questions auditors posed during the 2005 filing season. Although this is comparable to our results obtained for the 2004 filing season, the IRS continues to experience nominal improvement in decreasing the number of incorrect responses given. In addition, the IRS did not achieve its fiscal year 2005 accuracy rate goal of 81 percent. We believe this happens because assistors are not using the required tools. Other contributing factors include the complexity of the tax law and the number of potential questions assistors must be prepared to answer. For example, assistors are trained and expected to be knowledgeable in 318 tax law topics and 395 subtopics. They are expected to be able to respond to taxpayer issues for the current and prior tax years. Complexity exists for many taxpayers regardless of the intricacies of their financial situations. The Earned Income Tax Credit (EITC), for example, is a program that is so complicated, it is difficult for both taxpayers and the IRS to consistently and accurately determine eligibility. TIGTA recently completed an audit of the EITC program and reported that, according to the Office of Management and Budget, EITC accounted for $9.7 billion (21 percent) of the $45.1 billion in improper government payments. At the other end of the economic spectrum, white collar professionals and executives have used the complexities of the tax code to devise intricate schemes to illegally shelter income from taxation. Widely publicized corporate scandals over the last several years indicate that abusive tax shelters may be more common than once thought. The IRS has increased its oversight of tax shelters with some significant success. For example, the IRS recently reported that it has collected approximately $3.7 billion from the Son of Boss settlement initiative. These types of cases require in-depth probing to identify unreported income and to determine reporting compliance. Various proposals have been made to dramatically alter America’s tax system. Others have made recommendations for less sweeping, but more targeted changes. In the near future, the President’s bipartisan Advisory Panel on Federal Tax Reform will issue its report advising the Secretary of the Treasury on options to reform the tax code. Whatever proposal is chosen, simplifying the tax code could make it easier for taxpayers to voluntarily comply. The IRS’ National Research Program (NRP) is designed to measure taxpayers’ voluntary compliance, better approximate the tax gap, and develop updated formulas to select noncompliant returns for examination. The first phase of this program addresses reporting compliance for individual taxpayers, and data from this phase were used to produce the updated estimates of this portion of the tax gap. These initial findings should enable the IRS to develop and implement strategies to address areas of noncompliance among individual taxpayers. The next phase of the NRP, which has begun, focuses on Subchapter S corporations (Forms 1120S). These initiatives allow the IRS to update return-selection models for more effective return selection for its compliance efforts. A recent TIGTA audit reported that the return-selection formulas, developed in the 1980s, only accounted for the selection of 22 percent of the corporate returns selected for examination in fiscal year 2004. Updated selection models should contribute to more effective use of the IRS’ compliance resources. Each year, over 40 percent ($130 billion) of the total tax gap is attributable to underreporting among individuals with business income. More than 20 years ago, GAO recommended that Congress consider requiring withholding and improving information returns reporting for independent contractors. More recently, TIGTA recommended that the IRS initiate a proposal for a legislative change to mandate withholding on non-employee compensation payments, such as those provided to independent contractors. TIGTA maintains that implementing such a provision could reduce the tax gap by billions of dollars. The IRS has agreed to consider such a proposal. The Taxpayer Advocate’s 2003 Annual Report to Congress also made this recommendation. In a recent Joint Committee on Taxation report, the proposal was made to implement withholding on payments from government entities. The proposal recommended withholding 3 percent of payments to businesses and individuals (other than employees) providing goods and services to government entities. TIGTA agrees that this proposal may be a good first step as it provides an opportunity to test the feasibility and burden associated with such withholding. In addition to implementing withholding on non-employee compensation, other actions should be taken to improve compliance among independent contractors. For example, improvement is needed to address inaccurate reporting of Taxpayer Identification Numbers (TINs) for independent contractors. For tax years 1995 through 1998, the IRS received about 9.6 million statements for Recipients of Miscellaneous Income (Forms 1099-MISC), reporting approximately $204 billion in non-employee compensation that either did not contain a TIN or had a TIN that did not match IRS records. Legislation could address this problem by mandating that the payer and payee verify the TIN at the beginning of their relationship. Additionally, withholding could be mandated for independent contractors who fail to furnish a TIN. Implementing mandated withholding for this segment of independent contractors would result in an estimated $2.2 billion in increased revenue to the IRS each year. foreign-controlled corporations did not report tax liabilities from 1996 through 2000. Although individual wage earners who receive a Wage and Tax Statement (Form W-2) have their wages verified through a matching program, a similar comprehensive matching program for business documents received by the IRS does not exist. TIGTA has recommended that the IRS evaluate all types of business documents it receives to determine whether this information can be used to improve business compliance. An IRS study, based on TIGTA recommendations, found that in fiscal year 2000, business information documents reported $697 billion of potential taxable income. Furthermore, business information documents identified 1.2 million unresolved business nonfiler tax modules. A tax module contains records of tax liability and accounting information pertaining to the tax for one tax period. TIGTA has also reported on issues related to the increasing global economy. Investments made abroad by U.S. residents have grown in recent years, nearly tripling from $2.6 trillion in 1999 to $7.2 trillion in 2003. To address the tax compliance challenges presented by foreign investments, TIGTA recommended that the IRS make better use of the foreign-source income information documents received from tax treaty countries. TIGTA also recommended that, prior to issuing refunds to foreign partners, the IRS implement an automated crosscheck of withholding claims against available credits for partnerships with foreign partners. Taxpayer payment compliance means that the amounts owed are paid on time. However, for decades the IRS has allowed taxpayers with extended return filing due dates to send in late payments and pay only interest and small failure-to-pay penalties. Obtaining an extension of time to file a tax return does not extend the due date for tax payments, and failure to pay penalties are typically assessed when payments are made late, even if the taxpayer has received an extension. 88 percent of untimely tax payments for returns filed after April 15th were attributable to extended-due-date taxpayers. Corporations are required to pay estimates of their unpaid taxes in order to be granted extensions. However, TIGTA found corporate estimates to be highly flawed; in calendar year 1999 alone, approximately 168,000 corporations received an extension, yet failed to pay $1.8 billion in taxes when they were due. year 2008, of which approximately $29.8 billion would not be paid until after the end of fiscal year 2008. Due to the more complex nature of corporate taxes, similar figures were not available for corporations, although TIGTA estimated that by tax year 2008, approximately $768 million in additional corporate taxes would be timely paid if TIGTA’s recommendations were adopted. The IRS is currently studying TIGTA’s recommendations. fiscal year 1995 to 9,787 in fiscal year 2004. In the Collection function, the number of Revenue Officers decreased from 5,908 in fiscal year 1995 to 3,789 in fiscal year 2004. These decreases in staffing occurred during a period in which the number of tax returns filed increased by more than 10 percent. Sources: Criminal Investigation Business Performance Review, Examination Table 37, Collection Report 5000-23. 317,865 balance due accounts worth $2.96 billion in the Queue. In fiscal year 2004, these figures had increased to 623,477 balance-due accounts worth $21 billion. Additionally, the number of unfiled tax-return accounts in the Queue increased from 326,118 in fiscal year 1996 to 838,090 in fiscal year 2004. The number of balance-due accounts “shelved,” or removed from the Queue altogether because of lower priority, has also increased significantly. In fiscal year 1996, less than 8,000 of these balance due accounts were shelved, but in fiscal year 2004, more than 1 million of these accounts were removed from inventory. From fiscal year 2001 to 2004, approximately 5.4 million accounts with balance-due amounts totaling more than $22.9 billion were removed from Collection function inventory and shelved. Additionally, in fiscal year 2004 alone, more than 2 million accounts with unfiled returns were shelved. If increased funds for enforcement are provided to the IRS in upcoming budgets, the resource issues in the enforcement functions will be addressed to some degree. In addition, use of contractors should allow the IRS to collect more outstanding taxes. The IRS will have to be vigilant in overseeing these contractors to ensure that abuses do not occur. However, past experiences with lockbox thefts and insufficient contractor oversight provide valuable lessons to reduce the likelihood of similar issues occurring when contracting out collection of tax debt. There are many areas in which increased enforcement and/or legislative remedies could address noncompliance. For example, a recent TIGTA audit found a significant number of single shareholder owners of Subchapter S corporations avoided paying themselves salaries to avoid paying employment taxes. We estimated this would cost the Treasury approximately $60 billion in employment taxes over five years. Under current law, the IRS must perform an examination of these taxpayers to determine reasonable compensation. To accomplish this on any scale would require significant compliance resources. Additional resources might also help the IRS address the growth in fraudulent returns filed by incarcerated individuals. On June 29, 2005, I testified before the House Committee on Ways and Means, Subcommittee on Oversight on this growing problem. Although prisoner tax returns account for only 0.43 percent of all refund returns, they account for more than 15 percent of the fraudulent returns identified by the IRS. Refund fraud committed by prisoners is growing at an alarming rate. The number of fraudulent returns filed by prisoners and identified by the IRS’ Criminal Investigation function grew from 4,300 in processing year 2002 to more than 18,000 in processing year 2004 (a 318 percent increase). During that same period, all fraudulent returns identified grew by just 45 percent. year 2004, Fraud Detection Centers screened about 36,000 of the approximately 455,000 refund returns identified as filed by prisoners. Resources were not available to screen the remaining 419,000 tax returns. Those returns claimed approximately $640 million in refunds and approximately $318 million in EITC. For those unscreened returns, over 18,000 prisoners incarcerated during all of calendar year 2003 filed returns with a filing status as “Single” or “Head of Household” and claimed more than $19 million in EITC. Since prisoners were incarcerated for the entire year, they would have had neither eligible earned income to qualify for the EITC nor a qualified child who lived with them for more than six months. Although increasing enforcement is important in addressing the tax gap, the IRS must exercise great care not to emphasize enforcement at the expense of taxpayer rights and customer service. I believe that steps to reduce the current level of customer service should be taken only with the utmost thought and consideration of their impact, and only with all the necessary data to support these actions. Customer service goals must be met and even improved upon, or people will lose confidence in the IRS’ ability to meet part of its mission of providing America’s taxpayers quality service by helping them understand and meet their tax responsibilities. opportunity to share my views on the tax gap, and the work TIGTA has done in this area. I would be happy to answer any questions you may have. This definition and the associated categories have evolved over time. IRS tax gap estimates in 1979 and 1983 included unpaid income taxes owed from illegal activities such as drug dealing and prostitution. That practice was discontinued in the 1988 estimate. Reasons given for excluding are 1) the magnitude of the illegal sector is extremely difficult to estimate; and 2) the interest of the government is not to derive revenue from these activities, but to eliminate the activities altogether. Earlier tax gap figures such as those for 1965 and 1976 only included underreporting. While figures for more recent years (1992, 1995, 1998 and 2001) are more comparable, they are essentially the same estimates adjusted for the growth in the economy. Thus, comparing the figures does not show real growth in the tax gap. Lastly, comparisons among years are not done in constant dollars, so any real growth in the tax gap cannot be determined through this IRS data. The amount of tax that is imposed for a given tax year but is not paid voluntarily and timely. Internal Revenue Service, Tax Gap Facts and Figures 3, available at http://www.irs.gov/pub/irs-utl/tax_gap_facts-figures.pdf (last visited Oct. 20, 2005). Kim M. Bloomquist et al., Internal Revenue Service, Tax Noncompliance in the United States: Measurement and Recent Enforcement Initiatives (2004). General Accounting Office, Pub. No. GAO/GGD-95-157, REDUCING THE TAX GAP: Results of a GAO-Sponsored Symposium (1995). The TCMP was considered by the IRS and by external stakeholders to be burdensome to taxpayers because of the intensive “line-by-line” nature of its audits. See Kim M. Bloomquist et al., supra note 5; General Accounting Office, Pub. No. GAO/GGD-95-59, Tax Administration: Estimates of the Tax Gap for Service Providers (1994). See discussion infra p. 9. National Taxpayer Advocate, Internal Revenue Service, 2004 Annual Report to Congress (2004). Treasury Inspector General for Tax Administration, Ref. No. 2005-30-012, The High Income Taxpayer Strategy Was Effectively Implemented, Although Its Success Still Needs to Be Determined (2004); Treasury Inspector General for Tax Administration, Ref. No. 2005-30-029, The Limited Issue Focused Examination Process Has Merit, but Its Use and Productivity Are Concerns (2005). General Accounting Office, Pub. No. GAO/GGD-82-34, Further Research Into Noncompliance Is Needed to Reduce Growing Tax Losses (1982); General Accounting Office, Pub. No. GAO/GGD-79-69, Who’s Not Filing Income Tax Returns? The IRS Needs Better Ways to Find Them and Collect Their Taxes (1979). From the 1993 System of National Accounts (SNA93), published jointly by the United Nations, the Commission of the European Communities, the International Monetary Fund (IMF), Organisation for Economic Co-operation and Development (OECD), and the World Bank. These principles comprise a conceptual framework that sets the international statistical standard for the measurement of the market economy. SNA93 uses the term "underground economy." Kim Bloomquist, Internal Revenue Service, Trends as Changes in Variance: The Case of Tax Noncompliance (2003). Jim McTague, Underground Economy, Barron’s, Jan. 3, 2005. The paper defined the informal economy as that which produces legal goods and services that are not effectively regulated. Such activities can give rise to abuses by employers who fail to respect basic labor, safety, immigration, and tax laws, leaving workers without rights. “TGR” is Total Gross Receipts, and “Sch C” is Schedule C, the tax return schedule used by the self-employed to report a profit or loss from business. Staff of the Joint Committee on Taxation, 107th Cong., Study of the Overall State of the Federal Tax System and Recommendations for Simplification, Pursuant to Section 8022(3)(B) of the Internal Revenue Code of 1986 (Comm. Print 2001). Pub. L. No. 105-206, 112 Stat. 685 (1998) (codified as amended in scattered sections of 2 U.S.C., 5 U.S.C. app., 16 U.S.C., 19 U.S.C., 22 U.S.C., 23 U.S.C., 26 U.S.C., 31 U.S.C., 38 U.S.C., and 49 U.S.C.). Countries that have some sort of return-free filing as part of their tax systems include the United Kingdom, Denmark, Sweden, Germany, Japan, Ireland, and Mexico. Department of the Treasury, Report to the Congress on Return-Free Tax Systems: Tax Simplification Is a Prerequisite (December 2003). Treasury Inspector General for Tax Administration, Ref. No. 2005-40-133, Customer Accuracy at Taxpayer Assistance Centers Showed Little Improvement During the 2005 Filing Season (2005). Treasury Inspector General for Tax Administration, Ref. No. 2005-40-133, Administration of the Earned Income Tax Credit Program Has Improved, but Challenges Continue (2005). Internal Revenue Service, Robust Response for Executive Stock Option Initiative; Son of Boss Settlement Heading for $4 Billion, IR-1005-72, available at http://www.irs.gov/newsroom/article/0,,id=141014,00.html (last visited October 21, 2005). Treasury Inspector General for Tax Administration., Ref. No. 2005-30-130, The Small Business/Self-Employed Division Is Beginning to Address Challenges That Affect Corporate Return Examination Coverage (2005). Treasury Inspector General for Tax Administration, Ref. No. 2004-30-040, While Progress Toward Earlier Intervention With Delinquent Taxpayers Has Been Made, Action Is Needed to Prevent Noncompliance With Estimated Tax Payment Requirements (2004); Treasury Inspector General for Tax Administration, Ref. No. 2001-30-132, Significant Tax Revenue May Be Lost Due to Inaccurate Reporting of Taxpayer Identification Numbers for Independent Contractors (2001). National Taxpayer Advocate, Internal Revenue Service, 2003 Annual Report to Congress (2003). See Treasury Inspector General for Tax Administration, supra note 31. Treasury Inspector General for Tax Administration, Ref. No. 2002-30-185, The IRS Should Evaluate the Feasibility of Using Available Documents to Verify Information Reported on Business Tax Returns (2002). Internal Revenue Service, Report of BMF IRP Nonfilers for Tax Year 2000 (Corporations, Partnerships, and Trusts), Research Project 02.08.003.03, SB/SE Research (July 2004). Treasury Inspector General for Tax Administration, Ref. No. 2001-30-084, Stronger Actions Are Needed to Ensure Partnerships Withhold and Pay Millions of Dollars in Taxes on Certain Income of Foreign Partners (2001); Treasury Inspector General for Tax Administration, Ref. No. 2005-30-101, Compliance Opportunities Exist for the Internal Revenue Service to Use Foreign Source Income Data (2005). Treasury Inspector General for Tax Administration, Ref. No. 2003-30-132, The Regulations for Granting Extensions of Time to File Are Delaying the Receipt of Billions of Tax Dollars and Creating Substantial Burden for Compliant Taxpayers (2003) and Treasury Inspector General for Tax Administration, Ref. No. 2004-30-106, Changes to the Regulations for Granting Extensions of Time to File Corporate Returns Are Needed to Alleviate Significant Problems With Administering the Tax Laws (2004). Treasury Inspector General for Tax Administration, Ref. No. 2005-30-055,Trends in Compliance Activities Through Fiscal Year 2004 (2005). Treasury Inspector General for Tax Administration, Ref. No. 2002-30-055, Federal Requirements Need Strengthening at Lockbox Banks to Better Protect Taxpayer Payments and Safeguard Taxpayer Information (2002); Treasury Inspector General for Tax Administration, Insufficient Contractor Oversight Put Data and Equipment at Risk (2004). Treasury Inspector General for Tax Administration, Ref. No. 2005-30-080, Actions Are Needed to Eliminate Inequities in the Employment Tax Liabilities of Sole Proprietorships and Single-Shareholder S Corporations (2005). Hearing to Examine Tax Fraud Committed by Prison Inmates, 109th Cong. (2005) (statement of J. Russell George, Inspector General) and Treasury Inspector General for Tax Administration, Ref. No. 2005-10-164, The Internal Revenue Service Needs to Do More to Stop the Millions of Dollars in Fraudulent Refunds Paid to Prisoners (2005).